In comments to McClatchy on Tuesday - in the middle of a 2018 campaign for her seat in a state that has settled into the legal pot market - the California Democrat said she was open to considering federal protection for state-legalized marijuana. 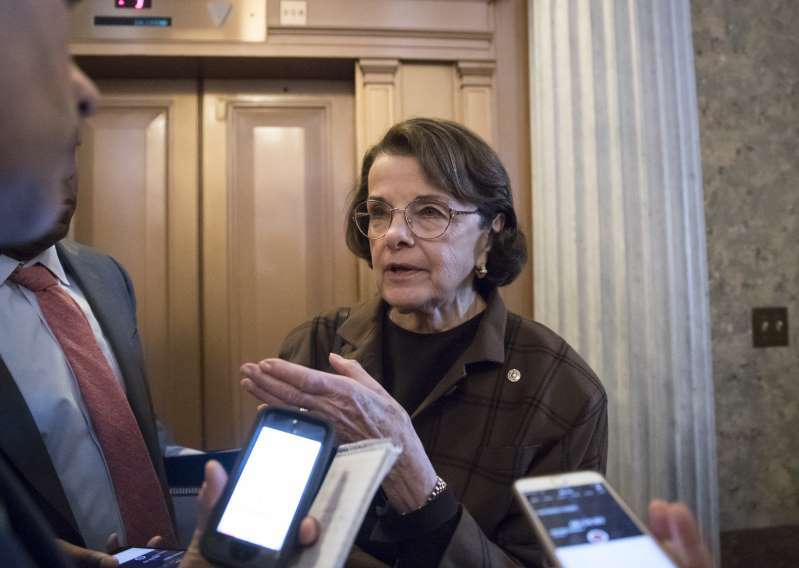 "Federal law enforcement agents should not arrest Californians who are adhering to California law," said Feinstein, who faces a challenge from Kevin de Leon, who is attracting many liberals who see Feinstein as too moderate. While not a champion of the marijuana issue, de Leon hasn't opposed legalization either. Democratic consultant Steven Maviglio said de Leon could use opposition to portray Feinstein as out of touch, an argument the strategist said has been the challenger's "meal ticket." While dozens of states have legalized marijuana at least for medical use, it remains illegal at the federal level. Controversy erupted in January when Attorney General Jeff Sessions dropped an Obama-era policy that gave states leeway to create legal markets, prompting fears that the federal government would start targeting dispensaries it felt they were operating legally. Feinstein explained her latest thinking about marijuana in comments to McClatchy. "My state has legalized marijuana for personal use, and as California continues to implement this law, we need to ensure we have strong safety rules to prevent impaired driving and youth access, similar to other public health issues like alcohol," she said. Feinstein has said that when she was a parole officer she saw too many criminals who "began with marijuana and went on to hard drugs." Legalization advocates have accused her of spreading "'reefer madness'-style disinformation campaigns" about California's 2016 ballot effort to legalize adult use of marijuana, called Proposition 64. Feinstein remained vocally opposed to Proposition 64. She gave qualified support for medical marijuana use at the time, but not for recreational use. In Congress, Sen. Cory Gardner, R-Colo., has been drafting a bill with Sen. Elizabeth Warren, D-Mass., that would leave the choice of legalizing marijuana officially up to the states. Its passage would be significant even in states such as California that have already legalized pot, easing the banking issues plaguing the industry and generally providing more stability. Those running marijuana dispensaries typically have to deal largely in cash, and cannot use most banking services. Banks fear federal penalties if they work with an illegal industry. That leaves dispensaries highly vulnerable to theft and attracts criminal elements. Gardner has said President Donald Trump told him he would sign such a bill, and Gardner's priority has been drafting one with a high chance of support from members of both parties. Feinstein said she would need to review Gardner's bill "to determine whether it's the best path forward," before commenting on it, but she indicated she could be supportive of his vision. Since the bill would almost certainly need to go through the Senate Judiciary Committee, Feinstein would be an important ally. Though limited in her abilities as the top Democrat on the committee rather than the chair, Feinstein and Chairman Chuck Grassley, R-Iowa, have been in near-lockstep on the issue in the past. The two have introduced multiple bills looking to ease regulations on researching the medical benefits of cannabidiol, a substance derived from marijuana. They introduced the most recent iteration in May 2017, but both stopped short of advocating for medical marijuana at the time, calling for more research into the issue as a logical next step. Tuesday, she said she "strongly supports" the legalization of medical marijuana. In 2015 Feinstein was the sole Democrat on the Senate Appropriations Committee to vote against preventing federal funds from being used to target state-legalized medical marijuana dispensaries. Several Republicans supported the amendment. The five-term senator is up for re-election in 2018, in a state that approved legalization 57 percent to 43 percent in 2016. Across the country, 61 percent of people believe marijuana should be legalized, according to a 2017 poll by Pew Research Center. Feinstein is generally expected to coast to re-election, and Democratic political strategists don't see opposition as hurting her greatly. Feinstein is beating her closest opponent, de Leon, by 26 points, according to the most recent poll by the Public Policy Institute of California. "Overall it's negligible. It could be part of the whole anti-Trump, 'What are they doing in Washington?' issue, but it's only a hot button for some people," Maviglio said. "However, there is a distinct possibility that you could see a coordinated campaign going after her on this, given financial interests in the state," he added. Championing legal marijuana could also be more advantageous this cycle, as a new California law goes into effect to automatically pre-register teens to vote when they apply for a driver's license or state ID card. State officials estimate it will add hundreds of thousands of new registered voters every year. Among those voters, marijuana legalization is hugely important, according to Will Rodriguez-Kennedy, president of the California Young Democrats, which has 135 chapters throughout the state and more than 10,000 members. While marijuana is already legal in the state, Rodriguez-Kennedy said it also has wide-ranging present and historical effects on other issues important to young people, such as mass incarceration, health care and racial biases. "It's easy to look at this one issue and see it as sort of silly, but it broadly touches on all these intersectional issues," Rodriguez-Kennedy said. "So I can say with confidence that this matters greatly to young Democrats." Support for marijuana legalization among millennials is at 70 percent, according to the Pew poll, while 35 percent of Feinstein's generation, the silent generation, supports legalization. But even among that group, support has slowly climbed in recent years. California Young Democrats have endorsed de Leon in the Senate race, and Rodriguez-Kennedy said this issue played into their view of de Leon as a more progressive candidate better suited to represent them.